The key to flawless, healthy skin doesn’t have to lie in a bottle or jar—it can also be achieved with light! The following is a sponsored post in partnership with JOOVV. All opinions are 100% my own. The ever-increasing demand for better-looking skin is at an all-time high. In fact, the number of spa visits per year across the globe has surpassed the 200 million mark. And it’s estimated the “beauty and anti-aging” market is worth nearly 100 billion dollars. It seems like nearly everyone is after a great complexion. Maybe you have experienced some type of skin issue during your lifetime. And as you probably know, skin conditions can be painful, uncomfortable, and bad for self-esteem. It’s quite common to seek a medical treatment that will relieve the problem. Within traditional medicine, the therapeutic options depend on the type of skin problem you’re trying to address. In most cases, in order to improve skin conditions and signs of aging, a practitioner will use a wide range of topical treatments and procedures, such as microdermabrasion or chemical peels. And just like other health issues, many people suffering from uncomfortable skin problems also turn to natural remedies to find relief. These include essential oils, salt baths, herbal teas, supplements, and compresses. JOOVV: Believe it or not, there are now over 3,000 scientific studies proving the powerful health and anti-aging benefits of red and near-infrared light therapy! But another alternative option – red and near infrared light therapy – has been growing in popularity within the aesthetics field. This treatment has been extensively studied for improving the skin and has become a prominent treatment within the dermatology arena. 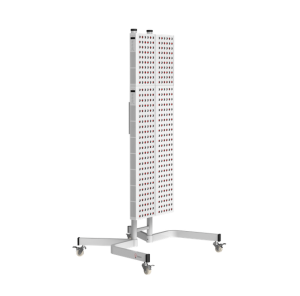 Light therapy is an effective treatment that can help a wide variety of skin conditions and is backed by a robust amount of clinical evidence. While many traditional skin treatments provide temporary relief, these studies have demonstrated real, lasting skin changes resulting from light therapy. An abundance of clinical studies have demonstrated that red and near infrared light therapy benefits the skin while reducing potential issues. But it’s essential to use the right wavelengths within the red and near infrared spectrum, along with optimal power output. A device like the Joovv will allow for short and effective treatment times in the comfort of your own home. You may have heard that light damages the skin. This is definitely true with UV light. But red and near infrared light therapy, on the other hand, can actually change your skin in positive ways. Research shows that light therapy can both benefit the look of skin and heal the underlying issue that is causing the condition. When red and near infrared light is absorbed by the skin, it stimulates new skin cells to grow in a healthier way, provides protection against damage, and helps heal a variety of skin problems. Not surprisingly, there’s a robust amount of clinical research that has demonstrated specific benefits of light therapy related to the skin. An extensive meta analysis in a 2013 issue of Seminars in Cutaneous Medicine and Surgery evaluated many ways in which light therapy can be used for the skin. Specific to anti-aging, this meta-analysis discussed numerous studies showing that LED light therapy can actually reduce and counteract signs of aging in the skin. Red and near infrared light has been shown to boost collagen, smooth wrinkles, enhance tone, as well as a host of other benefits. Also of note, while light therapy boosted positive skin results, it also reduced an enzyme that contributes to skin damage. 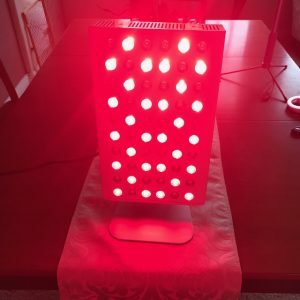 Red light therapy has been scientifically proven to boost collagen, smooth wrinkles, enhance skin tone, and reduce an enzyme that contributes to skin damage. 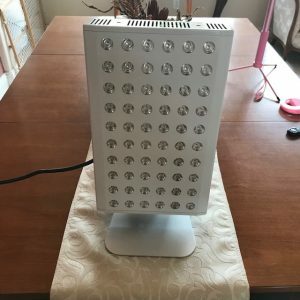 Now, you can have access to medical-grade light therapy devices with Joovv, the only company with FDA-cleared, full-body systems that can be conveniently used at home, including an all-new handheld portable device. Just like plants use sunlight to heal and grow, our body is able to harness specific wavelengths of light and turn them into cellular energy. This, in turn, stimulates your body’s natural healing processes. You’re not alone if you’re asking these types of questions. Increased circulation, via the formation of new capillaries, is responsible for some benefits. Or, in other words, more blood and oxygen helps deliver proper nutrients to damaged areas in the body. Enhanced activity within your lymph system leads to a reduction in swelling and inflammation. Increased collagen production, which directly relates to the elasticity, firmness, and fullness of your skin. Collagen is a long-chain amino acid and the most abundant protein in the body. It’s responsible for giving skin elasticity, hair its strength, and connective tissue its ability to hold everything in place. In fact, the collagen protein makes up 30% of the total protein in the body, and 70% of the protein in the skin! But don’t fear. 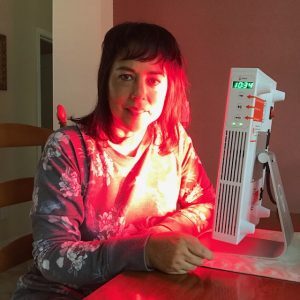 Red light therapy restores healthy cellular function, stimulating the production of collagen—which is why so many people have reported about the rejuvenating benefits of light therapy! Since going through perimenopause has made me want to try practically anything to feel better, I am thrilled Joovvsent me this machine. It has become part of my self-care rituals. I have the table top one that comes with a metal stand, very sturdy, and I do my “12-minute Joovv” every morning as I prepare for the day. It feels a bit warm as they recommend that you put your face 6 inches away from the device. And for only a few minutes. My goal is to enhance my appearance with the building of collagen, and I’d like to loosen the stiffness in my neck. So every morning, there I am with my Joovv, loving the meditative feel of it and relaxing towards a healthier looking appearance! 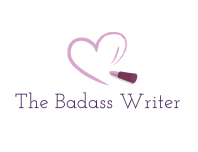 Thank you for reading THE BADASS WRITER. Do you have any experience with red light therapy or would you like to try it? Leave your comments below and please share this post on social and subscribe! I’d love to have you with me as we continue this blog! 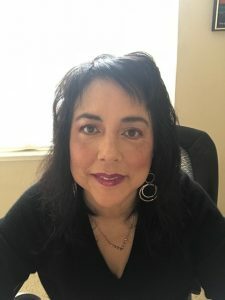 Coming up next, a look at K-Beauty’s Erborian brand cremes and a book review, Limitless: How to Ignore Everybody, Carve Your Own Path, and Live Your Best Life,by Laura Gassner Otting. See you soon!